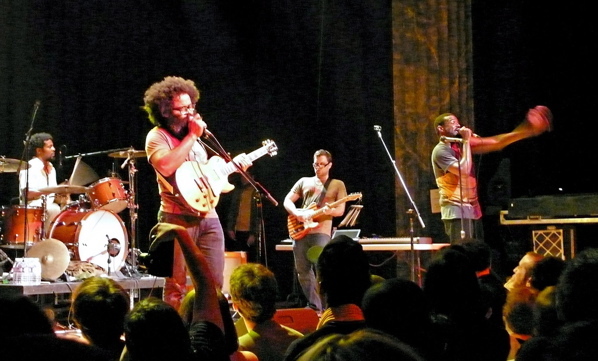 Brilliant Brooklyn rockers TV on the Radio (pictured above) kick things off alongside the Dirty Projectors, fresh off a collaboration with Björk. Tonight, 7 p.m., Metropolis, 59 St. Catherine St. E., $25. The highlight of the Canadian Underground Music Series will surely be the experimental electronics show: Witness the “pure energy” of Montreal ex-pat Corpusse, joined by Knurl, who creates astounding sounds using only contact microphones and scrap metal. Thursday, June 18, 9 p.m., Zoobizarre, 6388 St. Hubert St., $10. The series This Is the Real Jazz will culminate with pianist Marilyn Lerner’s Ugly Beauties, who play alongside the prepared guitar and lamellaphones (a.k.a. thumb pianos) of Rainer Wiens’ Dream Algebra. Friday, June 26, 8 p.m., Lion d’Or, 1676 Ontario St. E., $15. Clues, featuring former members of Arcade Fire and The Unicorns, lay down upbeat avant rock, with support from Dead Science. Thursday, June 18, 8:30 p.m., La Sala Rossa, 4848 St. Laurent Blvd., $12. Kid-friendly music, crafts and film screenings will take over Lahaie Park for the Popolo in the Park block party. Saturday, June 20, 2 p.m. – 9 p.m., corner of St. Laurent Blvd. and St. Joseph St.